One of the most charming stories of Gilman Village is the story of the rhododendron. 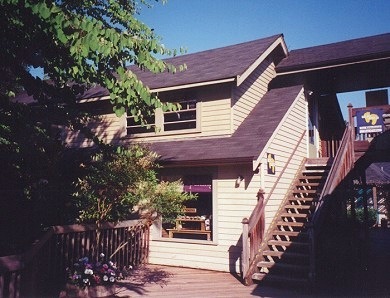 It was planted in front of the second Schomber house when it was completed in 1936 by Henry Schomber, son of the Issaquah baker, next door to the family home on Front Street. When the Schomber home was moved to Gilman Village in 1974, the then 38-year-old family rhodie was moved too. The house itself underwent a major face and roof lift when it arrived in its present location to accommodate businesses on the second floor.